The Exercise program assists adults to exercise regularly at National Guidelines for at least 150 minutes a week at a moderate intensity level, or 75 minutes a week at a vigorous intensity level, or a combination equal to 150 minutes of moderate intensity aerobic activity a week. Regular exercise is important for over 75 reasons including reaching and maintaining a healthy weight, keeping an immune system in top shape, increasing energy, reducing stress, being fit, and as a part of overall health and well-being. Yet only one in five Americans meets national guidelines for regular exercise. We know that it’s not always easy to start getting regular exercise and stick with it. This program can help those who are not ready to start exercising regularly, as well as those who must work to keep it up. Dynamic web activities matched to the individual’s readiness to change (e.g., a list of over 75 good reasons to exercise; a flip book linking physical activities to exercise interests; handling roadblocks that can keep people from exercising regularly; setting goals and making an action plan; rallying support and handling setbacks). 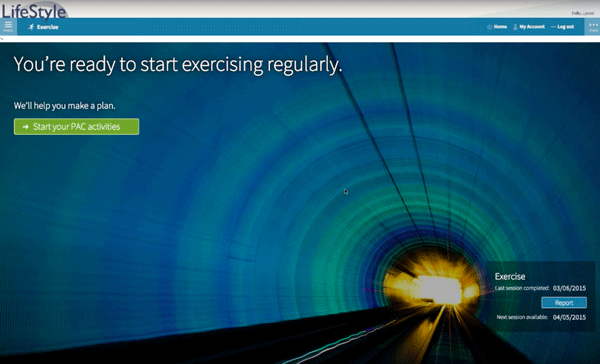 We have self-directed and coaching versions of our mobile optimized Regular Exercise program. Request a Regular Exercise Demo! See our Weight Management program page for additional study details. 1. Prochaska JO, Butterworth S, Redding CA, Burden V, Perrin N, Leo M, Flaherty-Robb M, Prochaska JM. (2008). Initial efficacy of MI, TTM tailoring and HRI’s with multiple behaviors for employee health promotion. Preventive Medicine , 6(3):226-31. 2. Prochaska, J.O., Evers, K.E., Castle, P.H., Johnson, J.L., Prochaska, J.M., Rula, E.Y., Coberley, C., & Pope, J.E. (2012). Enhancing multiple domains of well-being by decreasing multiple health risk behaviors: A randomized clinical trial. Population Health Management , 15(5), 276-286.